The chart above shows annual real manufacturing output per worker from 1947-2011 using data released today by the BEA for manufacturing output by industry, and data from the BLS on manufacturing employment. 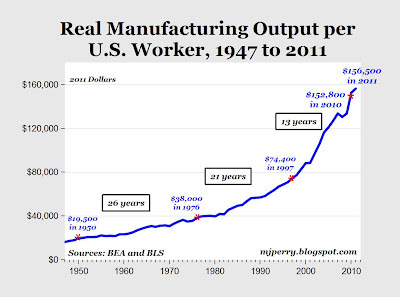 In 1950, the average U.S. factory worker produced $19,500 (in 2011 dollars) of output, and by 1976 the amount of output per worker had doubled to $38,500. Output per worker doubled again to $74,400 (in 2011 dollars) by 1997 (21 years later) and then doubled again to $152,800 by 2010, but it only took 13 years for the last doubling because worker productivity has been accelerating. Last year, manufacturing output per worker increased to a new record high of $156,500 (see chart), and almost ten times the output per worker in 1947. In other words, the average American factory worker today produces more output in an hour than his or her counterpart produced working almost a ten hour day in 1947 – and that’s why we’re producing record levels of output with fewer workers. Decision makers at 106 companies across a broad range of industries responded to the survey, which BCG conducted in late February. Thirty-seven percent said they plan to reshore manufacturing operations or are “actively considering” it. That response rate rose to 48 percent among executives at companies with $10 billion or more in revenues—a third of the sample. the changing economics that are starting to favor the manufacturing of certain goods in the U.S. In a report released last month, U.S. Manufacturing Nears the Tipping Point: Which Industries, Why, and How Much?, BCG predicted that improved U.S. competitiveness and rising costs in China will put the U.S. in a strong position to add 2 million to 3 million jobs in a range of industries and an estimated $100 billion in annual output by the end of the decade. On average for the last three decades, a 1 percentage point increase in the U.S. deficit translated into a 1 percentage point increase in EM growth. Unfortunately, global rebalancing implies that process running in reverse, where declines in the U.S. trade deficit – fewer imports from the rest of the world – pull down growth in emerging market countries. 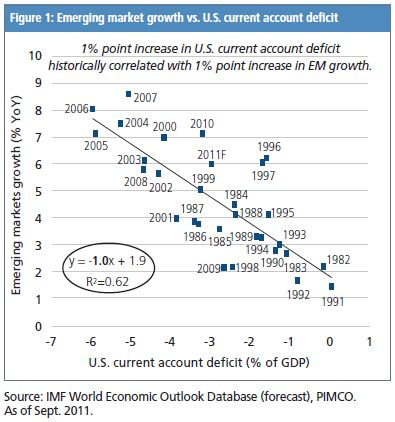 Note that the U.S. deficit does not fully determine the rate of EM growth: EM countries can outperform under some circumstances, while at other times they may underperform. But the U.S. external balance historically has exerted a powerful gravitational force on the rate of growth in emerging markets, suggesting that evolving away from dependence on the U.S. requires profound structural changes in the global economy. 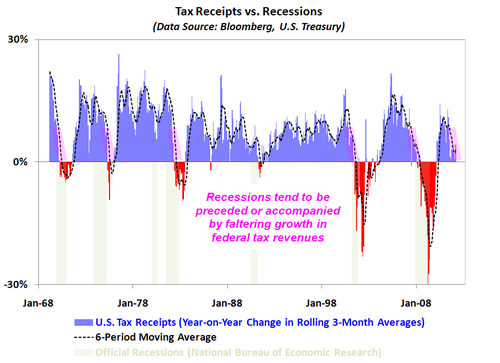 While it is not an infallible signal, the recent trend in federal tax receipts suggests the economy is not, as Treasury Secretary Timothy Geithner claimed on Sunday, “getting stronger.” If anything, it would seem to be the opposite. “Buy and Hold” investing will not work. Active management to participate in cyclical upswings, and avoid the majority of downswings, will be key. “Save More & Spend Less.” Savings will make a large chunk of your total retirement nest egg. This has always been the case. “Lump Sum Invest Vs. Dollar Cost Averaging.” Accumulate cash and invest in lump sums when things have become undervalued during the cyclical bear markets. This will provide better returns over time especially when combined with an active management strategy. “Income Over Growth.” The income theme will continue to dominate investor psychology particularly in the baby boomer generation. “The Inflation Benchmark.” The real benchmark for investors to focus on is inflation – not an index. Inflation, except in rare instances, actually compounds annually – stock markets don’t. Managing portfolios to limit losses and pace inflation will be key to ensure future purchasing power parity. “Diversification.” Real diversification between non-corollary assets will be key in the future to hedge off market volatility and reduce emotional mistakes. 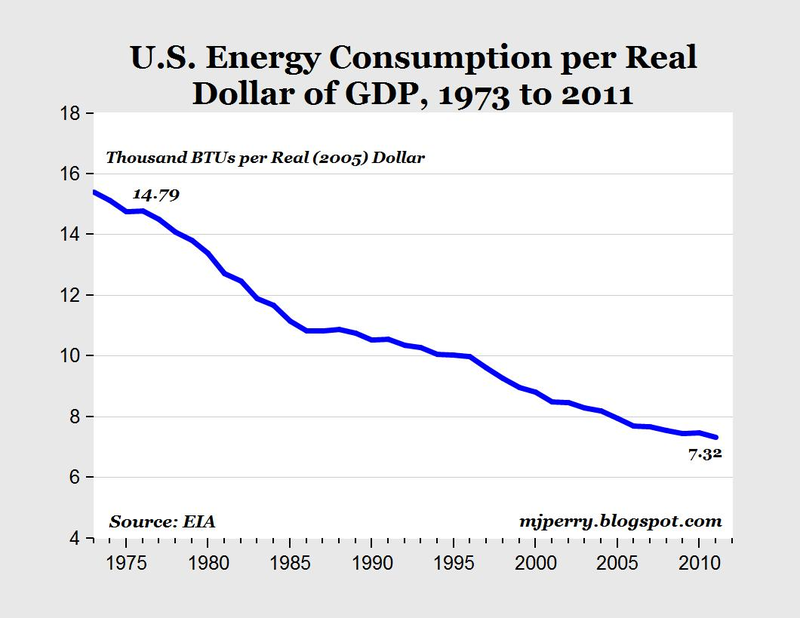 “Real Assets.” Investing in physical real assets such as income producing properties, oil and gas wells, precious metals, private equity, etc. will perform better in a rising inflationary environment. The key here is having a “real asset” behind the investment that will retain value even in deflating market environments. 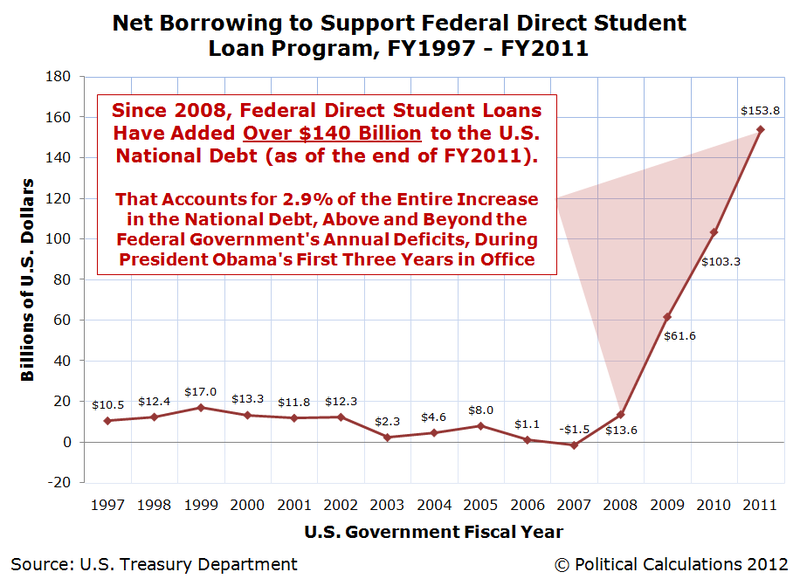 Here, we find that the federal government has sharply increased the amount of money it borrows for the sake of loaning it right back out to college students since 2008. Beginning in 2009, the net increase in those borrowings account for 2.9% of the entire increase in the U.S. national debt observed since 2008. 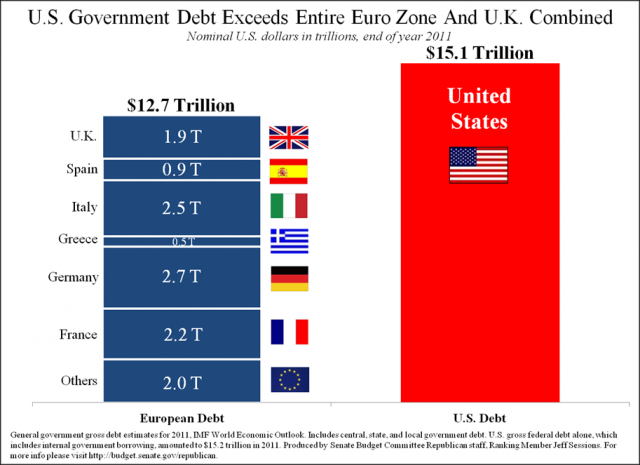 That amount is above and beyond the amount directly added to the nation’s total public debt outstanding by the federal government’s annual budget deficits. In this case, the disaster that would directly affect the lives of millions of people means being forced at the direction of government bureaucrats into a dramatically lower standard of living for the sake of being able to make the payments on their student loans to the U.S. federal government, without any real hope of being able to discharge that debt through bankruptcy. That, in turn, has the real potential to indirectly hurt millions of other people, because student loan payments are rising at the rapid pace supported by the government-subsidized cost of tuition, even though college graduates are entering into jobs that pay far below what is required to both live well and to support their super-sized student loan debt.